Enjoy great beer, good music and food at this annual ale festival on the UK’s longest heritage steam railway. The Welsh Highland railway runs for 25 miles from Porthmadog to the historic town of Caernarfon. The scenery on the Welsh Highland Railway is simply stunning. Add beer, food and live music and the Welsh Highland Railway’s annual festival becomes a party with a spectacular mountain backdrop. It’s a fantastic day out for ale explorers. The Welsh Highland line runs from Porthmadog Harbour Station past the Aberglaslyn Pass, on through the picturesque village of Beddgelert, past Mount Snowdon and on to Caernarfon with its imposing medieval castle and spectacular views across the Menai Straits towards Anglesey. In May, join fellow Ale Explorers for the Real Ale Festival – Cwrw ar y Cledrau which is fast becoming one of North Wales’ most popular real ale festivals. Now in its 11th season, it takes place at various pit stops along the West Highland line between Caernarfon and Beddgelert. There’s live entertainment from local bands and at the main site at Dinas Station near Caernarfon, more than sixty real ales are served along with ciders and perries. The return journey from Porthmadog to Caernarfon is a lengthy 4 hours and 30 minutes, so an alternative option is to take a shorter train ride to Beddgelert. Here you can mooch around the antique shops, have a spot of lunch and enjoy a homemade ice cream from the award- winning Café Glandwr. Take the gentle hour’s stroll back along the Fisherman’s Path at the edge of the Glaslyn River to pick up your return train further down the line at Nantmor Station. 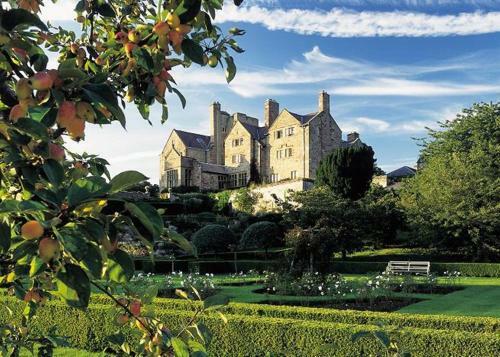 A distinguished 17th-century hall set in 200 acres of parkland, with spectacular views of Snowdonia. Rooms from £151 a night. I am welcome to travel on the Ffestiniog and Welsh Highland Railways at any time for a small fee of £3. I am even given my own doggy ticket. Unfortunately, I’m not allowed to travel in first class. Find more Foodie Things To Do in North Wales. Discover more Beer Tasting Experiences.